The other bits are some of my favourites, the coat was a gift from my friend Geneva who gave it to me when she moved to sunnier climates, but I found a similar Maje one here. I've had the jeans for ages and have been meaning to mention them, they're by a brand called Noisy May (who are on ASOS) and are the perfect boyfriend jean. I lived in them over the summer and they're warm enough for winter too. They've got that 'baggy but fitted' thing nailed to perfection - plus they're now in the sale, win! All in all, this outfit did make my day feel a little brighter. 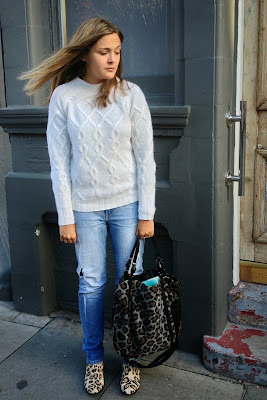 The jumper is so cosy and warm but not too stuffy (there is nothing worse than a 'wool sweat' in the winter) and the boots popped a little bit of life into an otherwise boring outfit... This weekend (which cannot come soon enough) I'm going to be clearing out my wardrobe of everything I didn't wear in 2013 (new years resolution), spoiling Lopez (he stayed with my parents whilst I was away and I missed him so much) and catching up with Lucy over hot chocolates and gossips. What have you got planned? Amazing outfit, love the boots! You look so gorgeous here; all that South African sunshine clearly did you well! 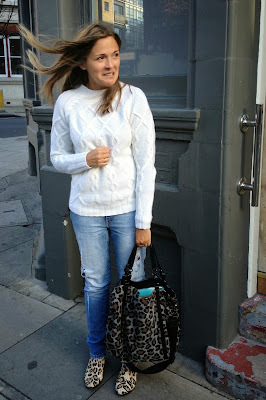 And I love the fisherman jumper (yay, you got it at last!) and leopard on you.